Spacious contemporary style home in Shongum Lake. Three finished levels. Walk out ground level with family room, office, full bath, laundry room, and utility room. First Level features Living Room, Dining Room with Andersen sliders to the rear deck, beautifully updated kitchen and baths and three spacious bedrooms. Oversized windows throughout create a bright, open floor plan. 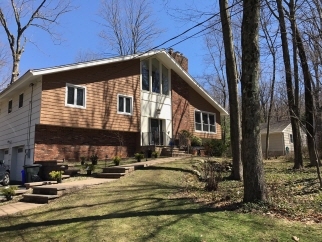 The 3rd level presents a bright loft/Great Room with huge windows, vaulted ceiling, fireplace, new neutral carpeting and beautiful views of the serene property and small babbling brook behind. Lake Rights. Enjoy all the lake has to offer – beach, boating, fishing, year round membership activities. Easy Access to Routes 10 and 287, award winning Randolph schools, NYC-bound transportation, shopping and Morristown cultural activities.